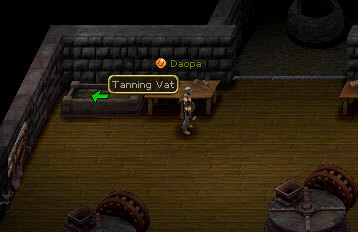 Double-click on the skinned hide, and then select the vat. After 6 seconds you'll be told whether you tanned the hide properly, or destroyed it. The odds of successfully tanning hide equals 15% + (Tanning Skill / 2) + (Intelligence / 6). Leather is worth 30, so you�ll get about 15 if you sell it at the Leathercrafting Shop. Leatherworkers can make leather into leather items.